From past experiences on this blog, I have found that Google employees are best contacted through public posts. In this particular post, I must voice my distaste at the newest (9/5/07) update. I am not a fan of wasted space. White space is acceptable in some places, but the newest update of Reader has added an intangible void. The left column has become unnecesarily wide. It must be 50-75 pixels wider than it once was. Also, the new icon to hide the sidebar was poorly implemented. The icon simply hogs space and ruins the consistency of the design (note the difference in spacing of sidebar items relative to column space). 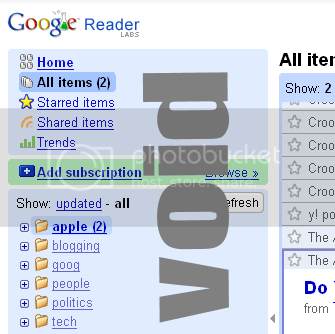 Update (9/6/07): They finally added a search bar to Reader. At least something was done right.